Well the name made it obvious what colour I just had to include for the cross -- and naturally it is red. 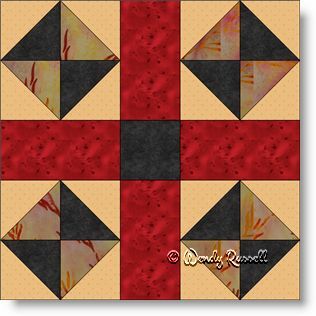 This simple five patch quilt block is comprised of squares, rectangles and half square triangles, so if a perfect choice for a beginner quilter. The fun begins as you play around with layouts for your quilt. As shown in the two sample quilts illustrated, you can create a very different look just by placement of the block and whether the blocks are set side by side, or on point. Now it is over to you.